DIN Standards are invented for a variety of components including industrial fasteners as DIN 431 Hexagon Jam Nuts. DIN 431 Nuts are manufactured from Carbon Steel, Acid-Resistant Stainless Steel Grade A2 or A4, Brass, Alloy Steel, Martensitic steel, Ordinary alloy steel or many other materials. 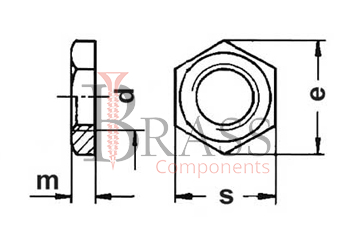 DIN 431 Hexagon Nuts are available in a wide range of sizes, shapes and materials. Complies with ISO 228-1 and GOST 8968-75 or GOST 15522-70. DIN 431 Nut is the smallest of all types of classified nuts. Excellent Corrosion Resistance and Torque Strength. High Toughness and Tensile properties. Mainly produced by high volume stamping on stamping process. Work piece is aligned in accordance with the height and diameter, removing possible defects, in the center of the future nut, which can form there when punching the hole. Used for connecting water and gas pipes. Applicable in Machine Building, Instrument Making, Mechanical Engineering, Automotive and other Industry. Used for fastening and connection in conjunction with other types of bolts or washers. Mainly used for mechanical stable and strong connections of pipes and valves. Suitable for operations such as spinning, deep drawing, bending and cold heading. 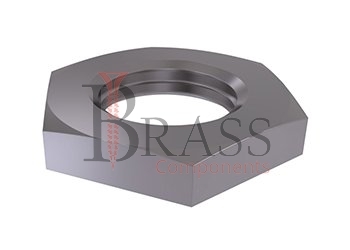 We manufacture DIN 431 Nuts as per Custom Specification and export in France, Italy, Switzerland, Poland, Greece, UK and other European Countries. For more Information, Please Contact Us or Inquiry Now.